pebblego.com/ ■ Licenses and Price: See website for pricing details per database. Quality and Effectiveness: PebbleGo is a simple, quality program from the Capstone Community for grades K–2. It provides multimedia databases, all in one place, for students in primary grades to do simple research. Many teachers in the primary grades spend a lot of time trying to find resources for research. They have difficulty finding a variety of resources at appropriate reading levels that will enable students to do authentic research and keep them safe from general search engines With PebbleGo, K–2 students can find the resources they need to research topics in five different areas: animals (also in Spanish), science, biographies, social studies, and dinosaurs. All of these resources are leveled for beginning readers. 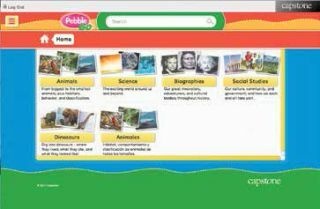 Ease of Use: PebbleGo is Web-based and users point and click to navigate. Students choose their topics and drill down to the subtopic they choose. All have passages that can be read to them with highlighted texts. Highlighted glossary definitions automatically pop up. Users can search for specific information or use a pinwheel to spin and go to random topics. At the bottom of the screen students find additional options, including buttons for printing and citing sources (which is very important but not often addressed), as well as relevant articles and activities that open in ready-to-print PDF files. Creative Use of Technology: PebbleGo allows children to research safely, with age-appropriate databases that are geared to their abilities. The multimedia approach means that students aren’t limited to text alone. They also have access to audio, pictures, videos, and PDF files that support the topic they’re researching. File tabs across the page help students stay on topic as they move from one subtopic to the next within their main topic. After teachers show students how to use the program on their laptops or iPads, students can work individually using these special databases. They can work online using one computer, in small groups, or even in large groups using a whiteboard to learn about many curriculum topics. Suitability for Use in a School Environment: PebbleGo gives primary students the ability to search six interactive tabbed databases, easily and safely, to find grade-appropriate information. Teachers can print PDFs of each database and can see what topics are available to guide students to a topic choice. With the “share what you know” sheet that students can download as a PDF, they have a built-in, ready-to-use, and topic-appropriate sheet for inputting their research. Students can also play games on their selected topic in addition to sharing their opinions on a “question of the day.” The program meets curriculum standards in such subjects as science, where topics are correlated to Next Generation Science Standards and STEM requirements. PebbleGo is an excellent resource that integrates content curriculum, early literacy skills, and information literacy skills for primary students. • All-inclusive databases are ready for primary students to use for focused research. • Database on animals is also available in Spanish. • Each topic has a printable article list, so teachers know what topics are available for each database.